Today’s post comes from Zibi at Fresh Slow Cooking. Hi, I’m Zibi I work as a researcher by day, and blog at Fresh Slow Cooking during my spare time. My slow cooker recipes start with real, fresh food. Usually I post recipes, but every now and then I also write about food philosophy and nutrition. Since Melissa offers great money-savings tips and recipes on her blog, I thought that you would be interested in how to make your own chicken stock. Making your own stock has several advantages. Homemade chicken stock is healthier. You control the ingredients, so you can choose to use organically grown chicken and vegetables, and adjust the amount of salt to suit your tastes. Also, since it doesn’t sit in a can, there’s no need to worry about the leeching of BPA. Preparing stock in your crock pot is also very efficient. One batch goes a long way. The stock is so rich compared to the store bought kind, that when you use it later to cook your favourite soup, you can dilute it with water at least 1:1. You can freeze it! I have larger portions (~2 cups) frozen in freezer bags for use in soups, but I also freeze smaller amounts in a muffin/cupcake tray. These are handy for making sauces or diluting and using to prepare your favourite risotto. Add the chicken pieces, bones, garlic, lemon rind and juice, salt, pepper, rosemary, bay leaves and water. Cook on low for 10 hours or overnight. Using a slotted spoon, remove the vegetables, garlic and herbs and discard. If you used chicken with a lot of meat on them ie. drumsticks, you can use the chicken in a salad or on sandwich, otherwise, discard the chicken pieces and bones too. If you prefer to remove excess fat, refrigerate the stock for a few hours and discard the fat that hardens on the surface. 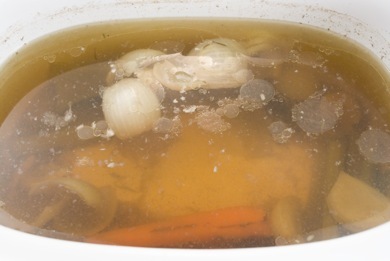 I have ongoing experiment for making vegetable stock so look for the results at FreshSlowcooking.com in the near future. Thanks for visiting my page today! Great tutorial on the chicken – I think my kids would scarf this one up! I've done this in the crockpot before and it's awesome! Love this idea! And I love the idea of adding lemon too. I'm visiting via Tempt My Tummy.